The Ruby River Hotel, Spokane, Washington features 245 over-sized guest room and suites with many offering stunning river views of the Spokane River and downtown Spokane. Each room is well appointed with either a single queen, double queen or single king bed. Other amenities to make your stay more comfortable include working desk, refrigerator, microwave, iron, ironing board and hairdryer. Complimentary wi-fi is also available for all in-house guests. Standard Single Queen rooms are non-view rooms located on both floors of the hotel. 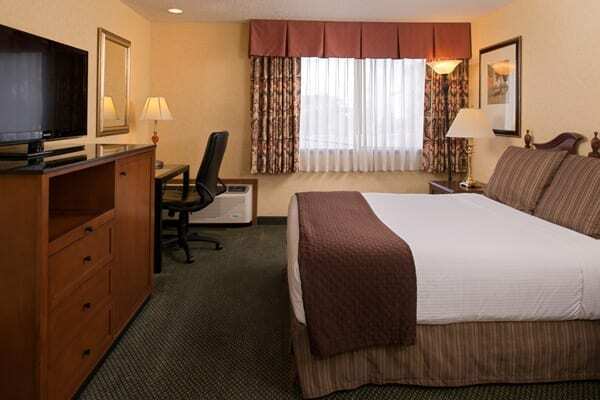 Each room features a single plush pillow top bed and is a perfect option for our single/double occupancy guests. Our ADA Standard Queen is non-view room that features a single queen pillow top bed. The bathroom is equipped with ADA bars only (no roll-in shower). Our ADA Standard Queen with Roll In offers a non-view single queen plush pillow top bed. This room is equipped with a ADA compliant roll in shower with bars. Standard Double Queen rooms are non-view rooms located on both floors of the hotel. Each room features two queen plush pillow top beds and is a perfect option for our double occupancy guests or families. Our ADA Deluxe Queen Poolside features a garden view with easy access to our pool. These rooms are located on the lower level and offer a single queen plush pillow top bed and ADA compliant roll in shower with bars. Our ADA Deluxe Double Queen Riverside rooms are located on the ground floor and offer a limited river view. 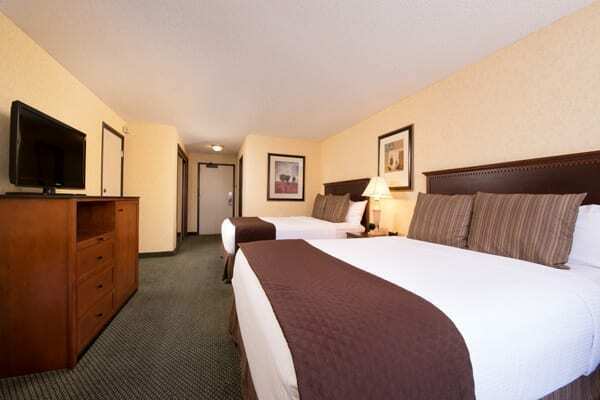 These rooms two double queen plush pillow top bed and ADA compliant roll in shower with bars. Deluxe Double Queen Poolside rooms are located on the lower floor of the hotel offering views of the garden area and pool. Each room features two queen plush pillow top beds and is a perfect option for our double occupancy guests or families. Deluxe King Poolside rooms are located on the lower floor of the hotel offering views of the garden area and pool. Each room features a single king plush pillow top bed and is an ideal option for our single or double occupancy guests. 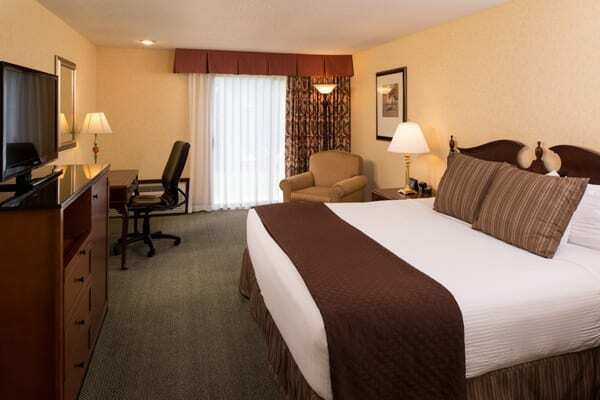 Our Premium Double Queen rooms feature two plush pillow top queen beds and offer stunning views of the Spokane River. Our Premium King rooms feature a plush pillow top king bed and offer stunning views of the Spokane River.